Truffles. They have come and gone, and while you may still have the pleasure of them in some restaurants, the season has left us, and with a bittersweet heart, I recall the words of French novelist, Alexandre Dumas:The most learned of men have been questioned as to the nature of this tuber, and after two thousand years of argument and discussion their answer is the same as it was on the first day: we do not know. The truffles themselves have been interrogated, and have answered simply: eat us and praise the Lord. 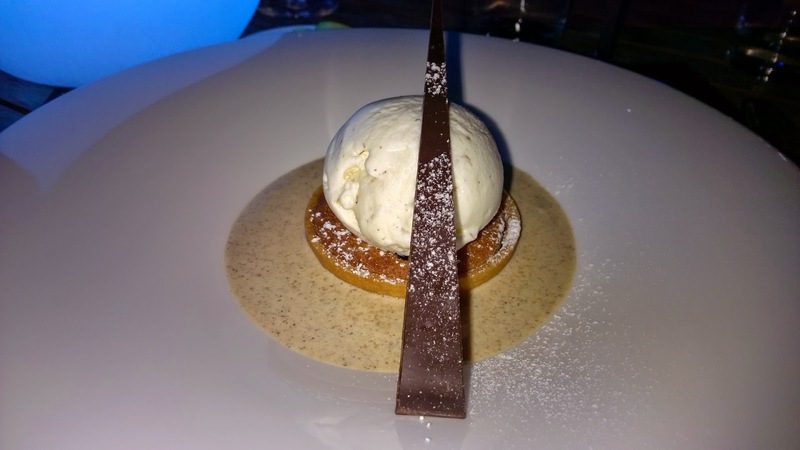 I arrive at Aqua, one of the most under appreciated restaurants that transforms its menu from an all day dining buffet concept to Italian at night. With a few days left of their truffles promotion, I walk in and this time I am offered a seat on the terrace. 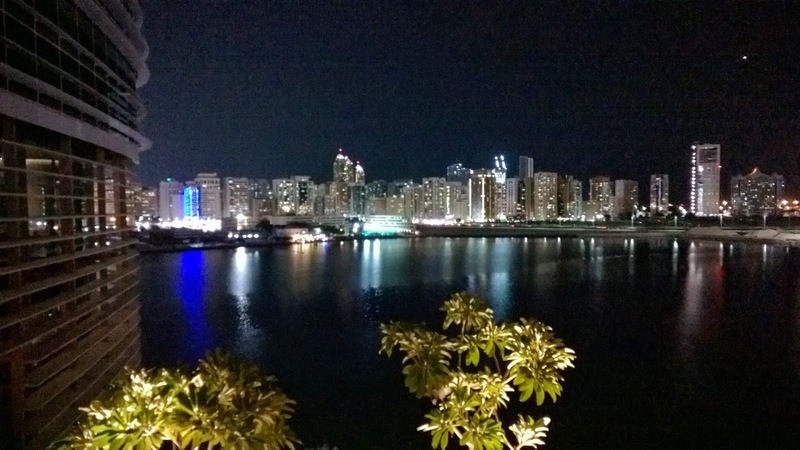 The city boy in me comes to life - the Abu Dhabi skyline, flashing lights and the music from Glo, the ultra cool terrace lounge at Rosewood, all make an impression on me. As sentimental as I am with my mind drifting back to that April night when I sat indoors on my first visit, my choice to sit outside is a great one, and will be an interesting contrast to that experience on the 2nd of April. (http://bit.ly/1ku3wv8) My waitress for the night is Olena, a waitress who on that night transformed my impression of waiting staff in Abu Dhabi through her deft balance of product knowledge, soulful and meaningful engagement and respect for the guest to have time to savour the flavours of the dishes alone. By the way, she remembered what I had that night. Yes, there are ways staff can access this information, but Olena does it the old fashioned way- making an effort to remember. The allure of bubbles can never be denied. A glass of NV Veuve Cliquot starts the evening. 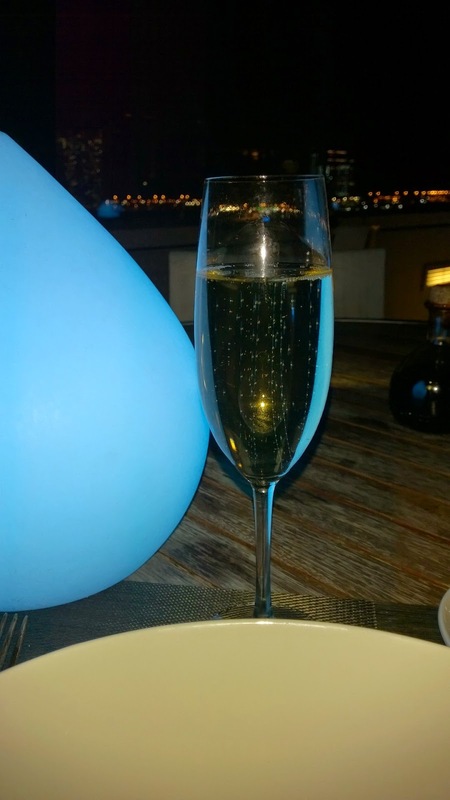 A glass of bubbly with the night sky in the background will evoke feelings of romance even in the most cynical of hearts, and tonight it lingers. How can I not at this time think of Coco Chanel's words that have been quoted ad nauseum: "I drink champagne on two occasions - when I'm in love and when I'm not." These musings are cut short when I am shown the menu. Tonight, though, I am happy to be in the hands of Chef Harris, my first culinary connection to Rosewood on that April evening. He illustrates that the traditional line between the chef and the guest has disappeared. He offers his insights into the courses he has prepared. A truffle feast awaits me, he assures me. 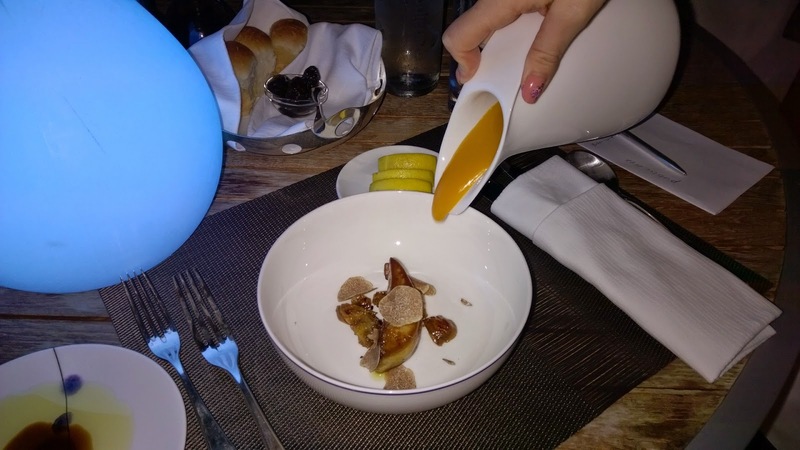 I start off with Pumpkin soup and pan seared foie gras, caramelized chestnuts & truffle brioche. 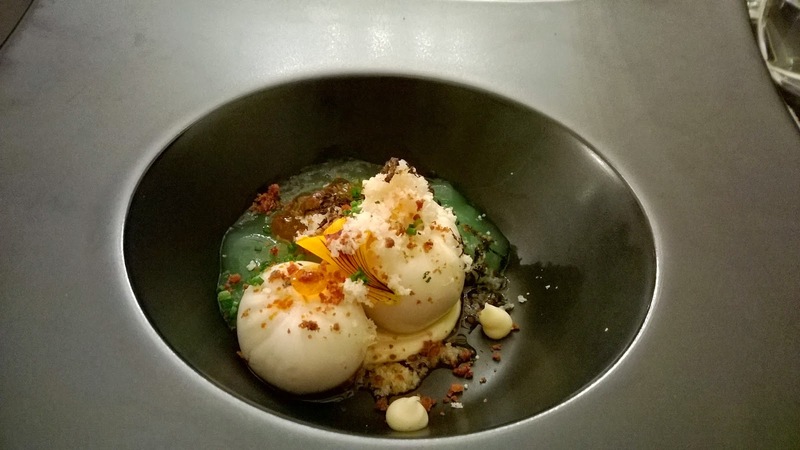 This dish has it all - theatre, contrasting textures and intense flavours. 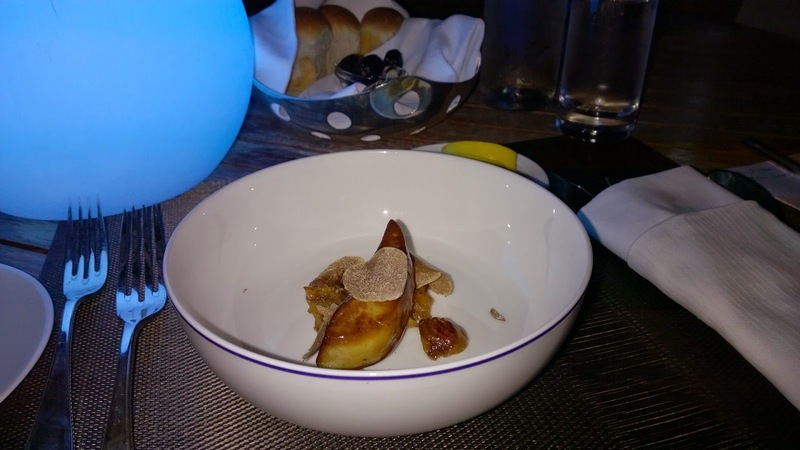 My soup bowl is presented and I see seared foie gras, chestnuts, shaved white truffles brought in from Alba in Northern Italy and for added texture, truffle brioche. After the soup is poured, I try the ingredients individually and finally all together. The chestnuts are just a delight. It is like having chestnuts cooked two ways, with the crunchy caramelised edges meeting the more traditionally cooked chestnuts. 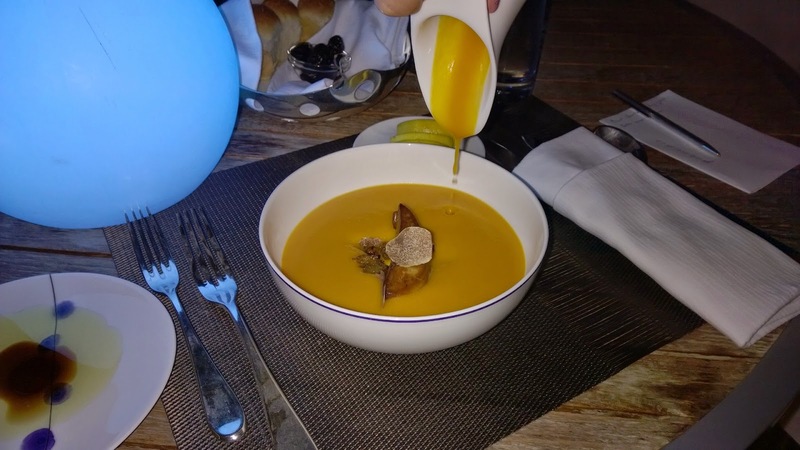 There is of course the intensity of the foie gras and truffles offset by the deliciously tasty soup, imbued with sweetness from a secret fruit ingredient. I am inspired to call my mother because I picture myself in the kitchen on Sunday trying her pumpkin which she loved making a bit sweet. She is not home, but Chef has unwittingly created a connection for me. The picture shows the smoothness of the pumpkin soup. I follow this up with the Aged Parmesan risotto. 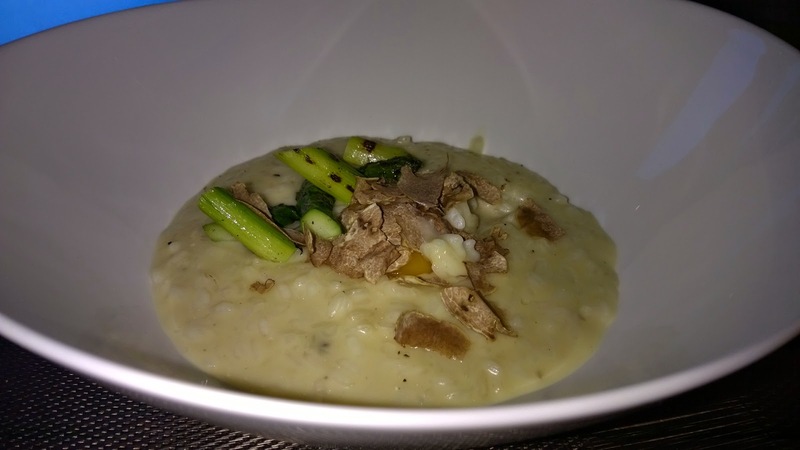 I can pick up the aromatic strength of the white truffles as Chef Harris shaves them onto the piping hot risotto. The breeze allows me to get that aroma even more. As I try it, I realise this dish is all about balance. The egg yolk, mixed into the risotto, so that you do not get that 'raw' egg taste, brings a contrasting flavour to the light saltiness of the risotto, not quite neutralising it, but serving as a foil. Then of course the asparagus, with its grilled quality and natural taste, definitely balancing out the richness of the risotto. Next up, I try a pasta dish hailing from Sardinia, the Ciusoni. It is like a cross between seashell pasta and barilla gnocchi. It is served with tomato braised cuttlefish, herbed breadcrumbs and capers. I like the combinations. Cuttlefish, an ingredient I am more familiar with in sashimi or sushi, works surprisingly well with the tomato. There is a nice texture brought about by the bread crumbs, but the real clincher for me is the ciusoni. It has a very tight and dense texture, with a delightful chewiness. Very nice. In anticipation of my final dish, I ask Olena to switch from the Veuve Cliquot to a red. Just my luck. 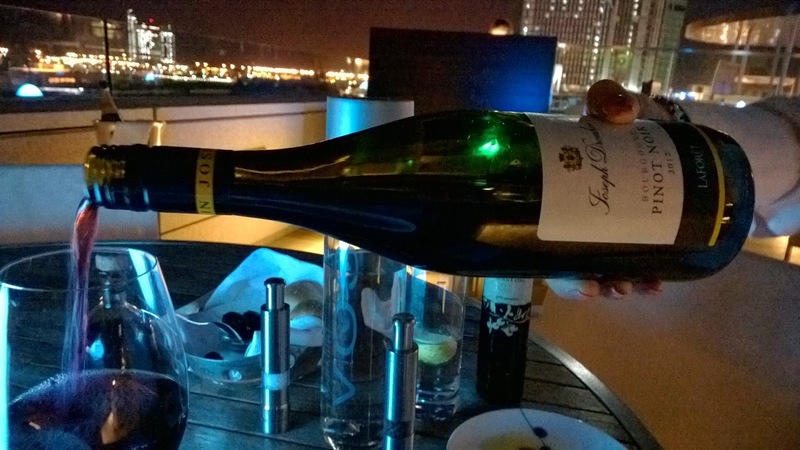 The red that catches my eye is a 2012 Joseph Drouhin Laforet Bourgogne Pinot Noir. I had the pleasure a month or so ago of attendinga wine dinner in the city where the exporter for Joseph Drouhin shared her insights. Not being a Pinot Noir man, I was surprised by the depth of this one. From the label: About the Pinot Noir, born in Burgundy, we created this wine like a perfume: with elegance and fruitiness in the Chalonnais, depth from the Cote d'Or. Within are red fruit aromas: raspberries, redcurrants and blackcurrants. I love the subtle spiciness of the mouth, its soft tannins and silky texture! It's attractive and well-bred, but doesn't take itself too seriously. An excellent choice. 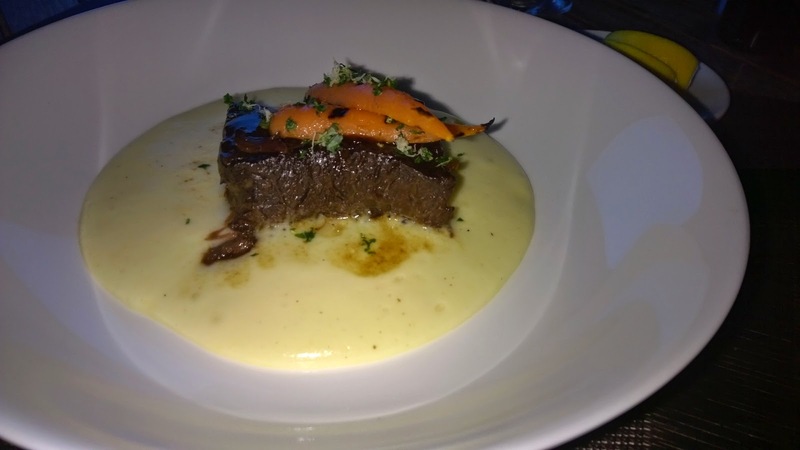 The Slow braised Wagyu short ribs, is so simple and has an element of homeliness to it. The carrots are perfectly par cooked, so they have a crunchiness about them. The braised wagyu is tender and I bite into it without effort. It is bathed in polenta foam, cornmeal that is boiled resulting in a smooth consistency, almost porridge-like. A thoroughly enjoyable dish and marvellously paired with the Pinot Noir. My dessert is all about the ice cream. Everything else on the plate, and I hope chef forgives me for this, moves to the background. Why? The ice cream. Truffle ice cream. I think the idea of a vegetable flavoured ice cream is foreign and indeed strange because of the brain. The brain cannot get around this. But thanks to time spent in the Far East, nothing surprises me when it comes to ice cream. My love affair with left-of-centre ice creams started on a Singapore Airlines flight from Taipei to Singapore. Chef gets the amounts just right. It is more than just a hint of truffles in the ice cream, but at the same time not too much. It makes you wish it is truffle season for a longer time. 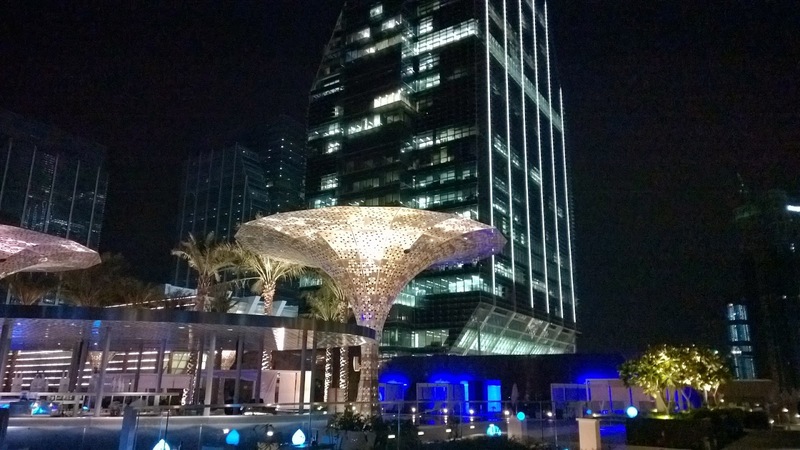 I have often written about the service here which in many ways is a benchmark for Abu Dhabi. Tonight though, the dishes took centre stage. 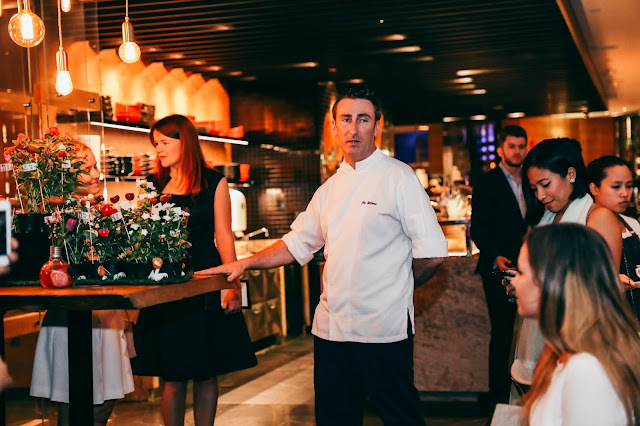 A point I often make is that with a handful of suppliers offering essentially the same ingredients to a number of hotels, there has to be something else that can distinguish a restaurant from others. In Aqua's case it is the staff like Olena, but tonight it was also about how Chef Harris put those ingredients to work. The combinations just complemented one another so well for me. Aqua, all-day dining and top class Friday brunch, has another reason to be visited. Guests need to look beyond the all-day dining facade of Aqua and visit at night when the character changes. The la fresco option in the cooler months gives Aqua what not many Italian restaurants in the city can claim - a gorgeous outdoor view matched by a wonderful ambience.